What recommended action steps do you have for the first 100 days as a business owner? What is the value of buying a business rather than founding one? What criteria do you recommend people have when deciding what kind of business to buy? Why do some business partners thrive while others tear their businesses apart? How can you evaluate whether a business is worth buying? How much of buying a small business is based on psychology vs. numbers? When selling your business, what is the main criteria owners look for? How did teaching others help you refine your own business buying systems? "Small deals are where it's at. There are over two million businesses for sale in North America. Only 1 in 13 will actually sell." In 2017 more than six million entrepreneurs started a business but 96% will fail within 10 years. The Leveraged Buyout—LBO—use financing against the business itself. The best deals are off-market, i.e., without using brokers. Brokers are trained to sell businesses to competitors to get more money for the seller. He owns whole or part of 17 businesses. Find a business that is a good business but the seller is in some form of distress. He targets businesses between $1 to $3 million in revenue so individuals usually target those types of businesses. 80% of small business owners won't list their business for sale so their competitors and staff don't know about what's going on. Entrepreneurs think it's cool to go start something from scratch. Around 2016 people were encouraging him to teach his processes. He prefers asset-based lending so the bank doesn't look at my credit worthiness. 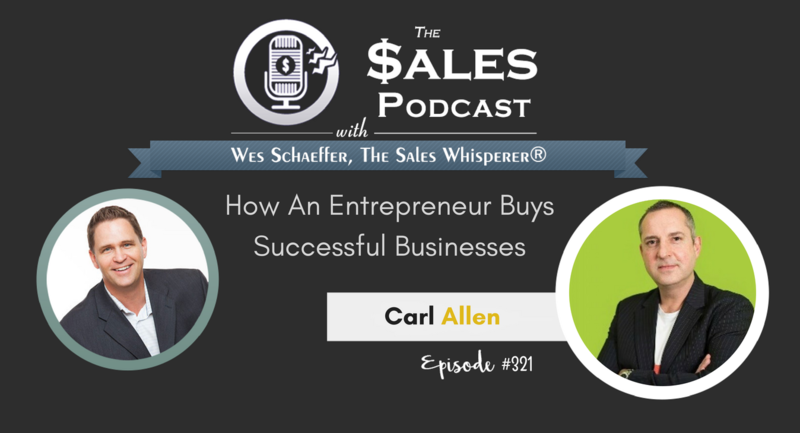 Buy Carl Allen's Book, "The Business Giveaway: How To Acquire A Quality, Established Business For Zero Cash: Veteran Business Acquirer Reveals “Secret” Formula For The First Time"